As Box Van headed out from our Nite Camp, a lovely sunrise came into view! The sunrise surprised me because I had not realized that our Nite Camp had been at such a high elevation. 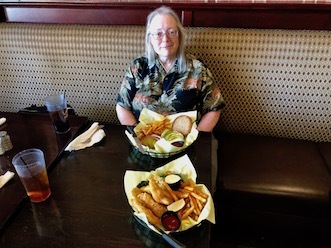 I was treated out to lunch yesterday by Reader Lisa at the City of El Cajon's Downtown Cafe. Lisa and I talked for a couple of hours. She is a lovely person! Lisa is planning to RV. Perhaps in a tall van. My fried fish and fries were scrumptious! I'm Day Camped in the Home Depot lot in El Cajon. I've just returned from a shopping trip. I bought brass fittings for the propane gas regulator hookup. All that I'll need to run that hookup into Box Van's interior is to buy black pipe [Home Depot does sell black pipe the size that I need]. Tomorrow I will drive to Amerigas in San Diego tomorrow morning to get the Manchester Propane Tank purged and filled. The brass fitting that I Blogged to about at 12:17 pm does NOT appear to be right!! The fittings are just a little bit too large in size. And for propane, using an improper fitting likely means an explosion and my death!! 6829 Manchester Tank Propane Tank ASME Permanent Mount Tank that I bought is like pulling a hen's teeth! But getting that thread information now is my job #1. I was outside looking at the output valve on my Manchester propane tank. That's when I noticed that there were some words on the top of the valve! I'm staying tonite at Hotel 6. Last nite I was very uncomfortable because of the cold temperature. Tomorrow my Manchester propane tank should be full. Then I may have some warmth by hooking up and igniting the Olympian Catalytic Heater inside Box Van! I know in Canada brass over the counter fittings are not propane rated. 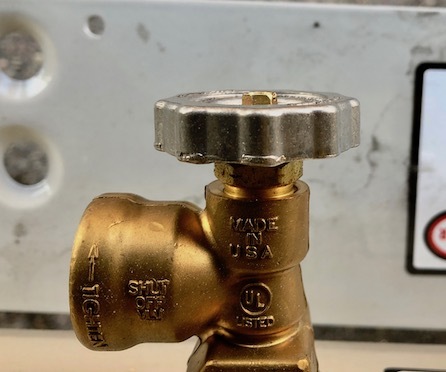 The propane fittings have 3 dots or a series of dots on the fittings. Also you may want to add a flexible rubber hose from the regulator outlet to the fixed black pipe. You could easily switch to a bbq cylinder should you run out of propane or a place who fills the style of tank you have. Your tank is filled by liters until liquid comes out the vent hole. Not all places fill these tanks. A bbq cylinder is filled by weight. Hope you are enjoying your new build. Isn't Lisa a very nice lady? Amerigas should have everything you need, if not go to a rv dealer. Please make sure this is done right. "Please make sure this is done right." Once everything is right it will be just right filling MsTioga. Hi George. I would advise having your "self installed " propane system professionally inspected. I m more then a little concerned when you're attempting to use the improper fittings. It is not a "self installed" propane system. I am purchasing parts which will be assembled by AmeriGas.